Kerosene – Blue is a versatile hydrocarbon solvent designed for conventional kerosene heaters and suitable for use as a cleaning agent (degreaser) and surface cleaner. Boiling range – slightly oily, slow ‘tail’. Blue liquid with a mild odour. Typically used as a lamp, heater and blow lamp fuel, engine degreaser and wood-fire starter. 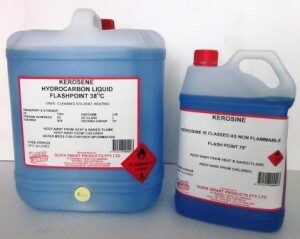 Please consult the MSDS on Kerosene before use.